These are no Futaba receivers, nor are they copies of it. 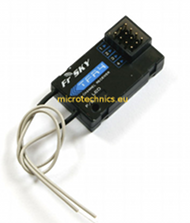 These receivers are an In-house development from FrSky Ltd.
Our inventory is already in Europe, in Belgium, so no hidden costs like custom's fees, taxes and also no certification problems: our products are CE certified WITH Declaration of Conformity! Check these points before ordering elsewhere !!! 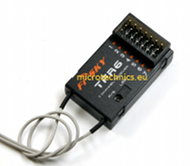 Also for 7-channels sytems like TM7, FF7, 6EX,7C. -FASST 2.4GHz Radio Multi-channel Systems and modules (TM8, TM10, TM12, TM14,FF10, TG8, 8FG, T8FG, FG12, T14, FX20, FX30, FX40, etc.) Also suitable for ground systems like 3PK,4PK,3 PM, 2PL,etc. and for 7-channels sytems like TM7, FF7, 6EX,7C. 1. Better resilience to interferences. 3. Allows use of 14 channels. 5. Will accept 2 Fail Safe modes. TFR8S will allow you to use up to 14 channels. 5 micro connectors ( JST) + 1 JR standard connector for CH3 + battery.